Looking for a formal colored necktie but seek something more interesting than a solid silver tie? 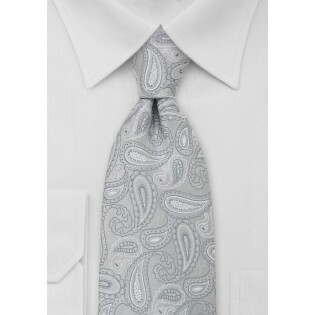 Then this paisley tie in silver and light gray by Puccini is perfect. It looks best when combined with charcoal gray suit, solid white shirt, and formal white pocket square. 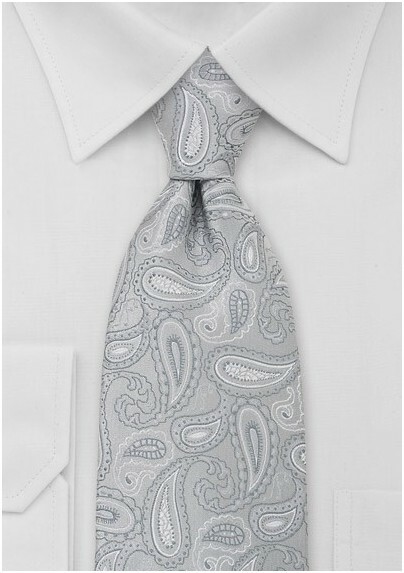 This paisley design necktie by Puccini is also available in bright red, sun-yellow, and sky-blue. This tie is made from a unique fabric called microfiber. It is a textile that looks exactly like silk but is more resistant to stains and wrinkles.